A detention center in McAllen, Texas, one of the facilities where migrant parents and children were separated. June 2018. This month, our report focuses on the fallout from the U.S. “zero tolerance” policy as the Trump administration attempts to remove limits on the detention of minors, and as deported parents seek to be reunited with their children. In addition, a significant number of U.S. citizens born or living near the U.S.–Mexico border are being denied passports. Extended Detention of Child Migrants: The Trump administration has taken steps to eliminate the 1997 Flores Agreement which sets standards for the detention of minors, including a detention limit of 20 days. 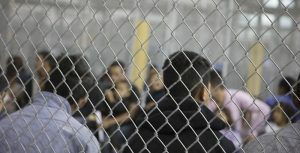 The current extended detention of children violates this protocol as well as a recent court order, and Homeland Security’s goal appears to be the removal of constraints on indefinite detention for minors and other protections which would likely result in more detention facilities and longer detention times for children. Read more about the legal ramifications of these actions here: https://www.washingtonpost.com/world/national-security/trump-administration-to-circumvent-court-limits-on-detention-of-child-migrants/2018/09/06/181d376c-b1bd-11e8-a810-4d6b627c3d5d_story.html?noredirect=on&utm_term=.95c0f44034b3. Parents Deported Without Their Children: Following the imposition of a “zero tolerance” policy for migrants arriving at the U.S.–Mexico border, more than 2,500 migrant children were separated from their parents. In response to a court order, most of these minors have been reunited with their parents after their traumatic experience, but approximately 400 of the detained children are still being held in U.S. facilities because their parents were deported. In many instances, these migrant and asylum-seeking parents signed deportation documents unknowingly, thinking the paperwork was required in order to see their children again. Efforts are currently underway by lawyers and case workers in the U.S. and Central America to reunify children and parents in the absence of sufficient identifying information which Immigration and Customs Enforcement failed to record. This article and video cover the situation in Guatemala: http://www.latimes.com/world/la-fg-guatemala-separated-families-20180831-htmlstory.html?utm_source=Migratory+Notes+Pop-Up+Newsletter&utm_campaign=061b979402-EMAIL_CAMPAIGN_2018_09_06_04_54&utm_medium=email&utm_term=0_084466b101-061b979402-514465013. Passport Denial at the Border: The latest in border crackdowns is the denial of passports to U.S. citizens along the border, many with Latino surnames. The U.S. State Department, asserting a concern about falsified birth certificates, is throwing out a wide net, refusing to issue or renew passports for many people who have never received such scrutiny before, have voted without incident, and even served in the military or Border Patrol. Some passport applicants have been jailed in detention centers while deportation proceedings are initiated. At the very least, existing passports are confiscated, leaving people in legal and administrative limbo until they provide evidence of being born in the U.S., or take the government to court. More details are provided in this article: https://www.washingtonpost.com/world/the_americas/us-is-denying-passports-to-americans-along-the-border-throwing-their-citizenship-into-question/2018/08/29/1d630e84-a0da-11e8-a3dd-2a1991f075d5_story.html?noredirect=on&utm_term=.0a296f3e7207.